In December the Reclaim Our Democracy group sponsored a talk by legendary Diet for a Small Planet author Frances Moore Lappé and organizer Adam Eichen. They shared highlights of their empowering new book Daring Democracy. They pointed out that without democracy there’s almost no chance of tackling distinct environmental, racial justice, labor, poverty, or food justice problems, and they write about specific ways to engage in a movement that will save our democracy. 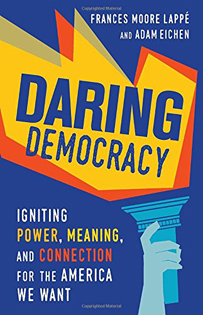 On Tuesday, February 27th at 7:30 p.m. a small group at First Parish in Concord will be getting together to discuss Daring Democracy and how we can put some of the authors’ ideas to work. PLEASE JOIN US. For questions or to sign-up to attend, please contact Nancy Cronin at nrcronin@verizon.net.